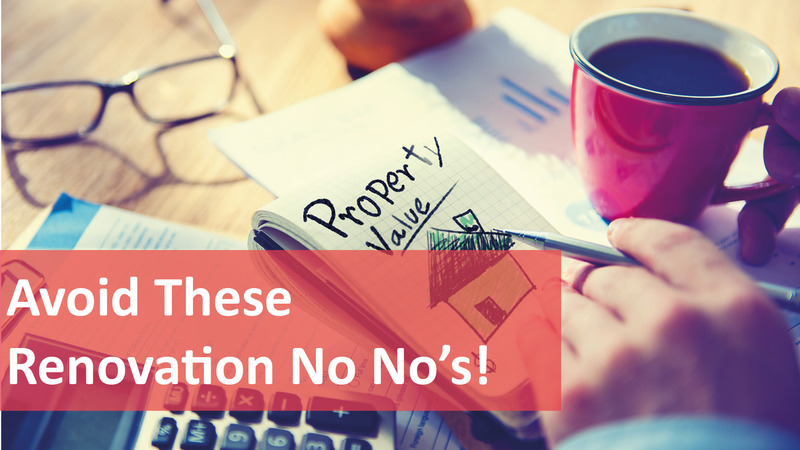 Avoid These Renovation No No’s! Renovations, when done correctly, can enhance the look and feel of the space, as well as add value, but it’s important to stick to the plan, particularly if you are planning on using the property as an investment. Overcaptalisation occurs when the homeowner spends more money than they could legitimately claw back at sale time. You can see how easy this is to do: you get excited by the renovation process, splurge a whole heap of money on fixtures and extras, and before you know it you have blown your budget. Prospective purchasers will notice things like cheap fixtures, cabinets and dodgy paintwork, so it’s worth doing it right. This doesn’t mean you need to install a Masterchef-worthy kitchen or gold tapware, but avoiding the cheap and nasty finishes will leave your buyers happy. Budgeting for your renovation is crucial to avoid costly blowouts. Cost your labour and your materials first and then add them to the spreadsheet. Also factor in costs such as building delays and time spent away from work due to the renovations. Make sure you add a buffer, too, for the unexpected. Pools are great in theory, but can be a nightmare to maintain and don’t always add value quite the way people think. A Swimart survey found 90 per cent of pool owners believed their pool boosted the value of their house by an average of $30,000; with estimates ranging between $10,000 and $100,000, depending on size, style and location. But pools need to be subtle and not overwhelm the rest of the home. Furthermore, it needs to suit your neighbourhood. If it is standard for similar homes in your area to have a pool, then it will mostly likely enhance your sales price, but if pools are a rarity in your suburb then this could work against you. These are the type of renovations that make no practical sense and detract value from a home, but are done on the whim of an owner. You may have always dreamed of a giant marble statue in your backyard, or have a particular interest in feature walls with words written on them, but you should be aware that other people are unlikely to share your passion. There is nothing wrong with putting your own stamp on things, just be aware of the consequences if you intend to sell. You want to appeal to the broadest market, so best to keep things neutral and allow the new owner to put their stamp on things. Do you have av investment property and you’re looking for a tenant? We can manage the property for you and reduce your stress! Call our experienced team here at We Love Rentals® on 08 6254 6300.